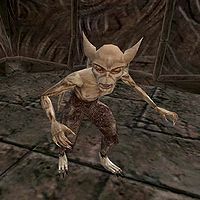 Lustidrike is a unique scamp located in the Antechamber of Ald Daedroth. He offers free sujamma to all comers to celebrate the Mad God Sheogorath. However, he does not hand out actual sujamma. Instead he is supposed to give you the far less potent "Lustidrike Cocktail", which is supposed to be achieved through a spell rather than a potion, although the effect is bugged. Lustidrike is one of two scamps in the game that you can talk to, the other being Creeper. "Wanna drink, buddy? Got anything you want, so long as it's sujamma." If you return Lustidrike will see if he thinks you can handle it (your intelligence is still above 30), and will offer you more: "Back already? Well, go ahead, drink up. It's free." or look out for your safety: "Back again? I dunno, pal. You look like you've had plenty. Or maybe you ALWAYS look that way." and "Sorry, pal. You've had enough. Go get some exercise or something. "(if you press the matter). The name Lustidrike could be intended as a pun. In Norwegian, "Lyst i drikke" can be translated as "Really enjoys drinks". The spell Lustidrike should cast on the player does not work at all, as scamps are unable to cast spells in general. This page was last modified on 31 December 2014, at 20:23.